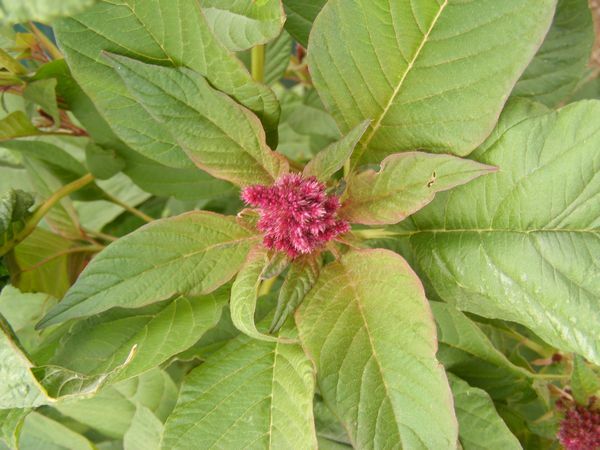 Amaranth is a traditional food plant in Africa. It is an inexpensive high quality food crop that can either be grown for its seeds and/or as spinach (marog) and has the potential to improve nutrition, boost food security, foster rural development and support sustainable land care. 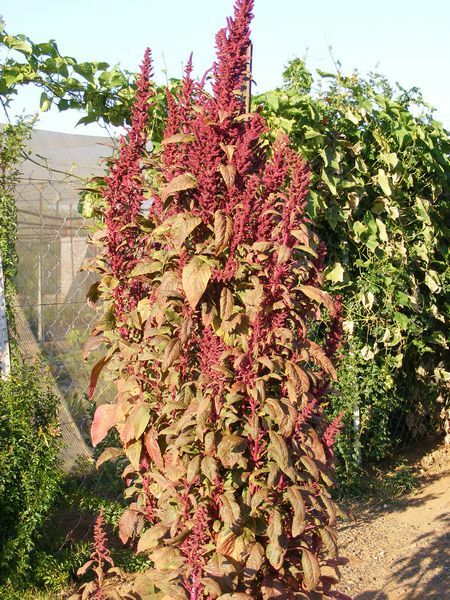 Red leaf Amaranth is an erect branched annual that can grow up to 2m in height. The green leaves are variable in size and turn purplish-red as the plant matures. Tiny red flowers grow in clusters at the top of the stems and in the leaf axils. Amaranth is easy to cultivate and highly productive - they are, like maize and sugar-cane, classified as C4 plants that follow the 4-carbon photosynthetic pathway. This means that they use low water consumption and make very effective use of bright sunlight. They will tolerate very high temperatures but cannot withstand frost and need high levels of soil nitrogen for optional yields. Seeds are sown early in spring and seedlings must be spaced in rows a meter apart. Plants can be repeatedly harvested by regularly cutting every 10 days. Amaranths are recorded as food plants for some Lepidoptera (butterfly and moth) species. The leaves are used as spinach. The seed is highly nutritious and is a good supplement to other cereals like maize and wheat. The root of mature amaranth is white and can be cooked with tomatoes or gravy - it has a milky taste and is alkaline. The whole plant - leaves, roots and stems. The Vegetable and Ornamental Research Institute at Roodeplaat, north of Pretoria analyzed the nutritional value of various Amaranth species and they found that the Amaranth is more valuable than any other leaf vegetable. The leaves are a good source of protein - a portion of 100g will provide half of the body's daily allowance for protein. The iron content can be as high as 5 times the recommended daily allowance, the calcium content at least double and the vitamin A content can be up to 20 times the recommended daily allowance. Cooked amaranth leaves are also a good source of vitamin C, folate, thiamine, niacin, riboflavin and minerals including calcium, iron, potassium, zinc, copper, and manganese. 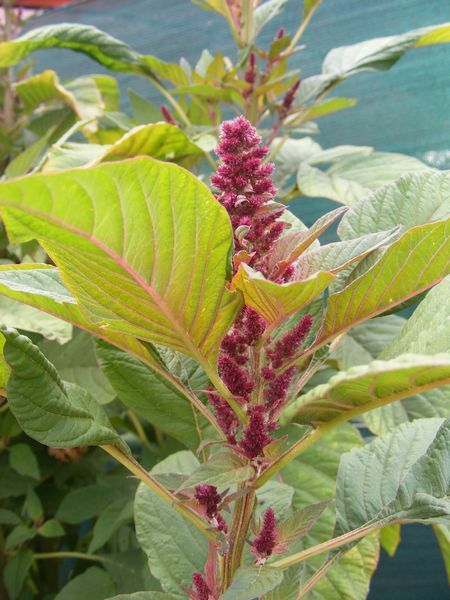 Amaranth seeds are a good source of thiamine, niacin, riboflavin, folate, and dietary minerals including calcium, iron, magnesium, phosphorus, zinc, copper, and manganese - comparable to common grains such as wheat germ, oats and others. Amaranth contains about thirty percent more protein than cereals like rice, sorghum and rye and can be a promising source of protein to those who are gluten sensitive - unlike the protein found in grains such as wheat and rye, Amaranth's protein does not contain gluten. According to a 2007 report, amaranth compares well in nutrient content with gluten-free vegetarian options such as buckwheat, corn, millet, wild rice, oats and quinoa. 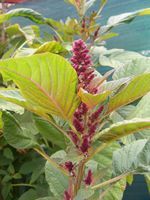 Amaranth is rich in the essential amino acid lysine that is limited in other grains while grains such as wheat and corn are comparatively rich in amino acids that amaranth seed lacks - thus - amaranth and other grains can complement each other. Studies have shown that like oats, amaranth seed may be of benefit for those with hypertension and cardiovascular disease - regular consumption reduces blood pressure and cholesterol levels. Where the active ingredient in oats appears to be water-soluble fiber, amaranth appears to lower cholesterol via its content of plant stanols and squalene.